The use of words, phrases, symbols, and ideas in such as way as to evoke mental images and sense impressions. The use of expressive or evocative images in poetry, art, literature, or music. The speaker or voice of a literary work who is doing the talking. Thus persona is the “I” of a narrative or the implied speaker of a lyric poem. The poet’s or persona’s attitude in style or expression toward the subject. Tone can also refer to the overall mood of the poem itself, in the sense of a pervading atmosphere intended to influence the readers’ emotional response and foster expectations of the conclusion. Chances are that you have probably read Dickinson before in your High School English classes. Dickinson is one of the most famous female poets in history and one of the most widely read American poets around the world. Part of her popularity is due to the aura of mystery surrounding her life. Dickinson lived in Amherst, Massachusetts and by most accounts, she lived the majority of her life as a recluse. As an adult, she rarely left her home, entertained few visitors, and only published a dozen of the nearly 1,800 poems she composed in her lifetime. Some of these poems were written in the margins of pieces of paper. Others were sewn into little books she made for herself. The poems sound like they were written by a woman living in her own little world. Take a look at “I Felt a Funeral in My Brain” and trace out the imagery Dickinson provides. It’s dramatic, stunning, emotional, and yet it is never clear what the exact subject of the poem is. Yet, because it is so well composed, you get the sense that Dickinson herself knew exactly what she meant and that it all made sense in her own world. It’s this mystery of the recluse poet and her captivating, but illusive poetry that has made Dickinson wildly popular after her death even though she lived in obscurity. Consider the speaker of the poem. The poem is written from the perspective of an “I”, and the subject matter is so personal that it is literally happening within the brain of the speaker. What can you learn about the speaker from the poem? Think about the theme of the poem. Dickinson starts us off at a funeral and so we must confront the theme of death, but clearly this is not a literal funeral. Consider the poem psychologically. How would you describe the psychological or emotional experience of a funeral in the brain? Pay attention to what happens at this funeral and think about what the emotional or psychological impact may be. Although Dickinson wrote in rhyme and meter, she was very unorthodox in other ways. For example, notice how some of the rhymes almost rhyme, but not quite. This is an example of slant rhyme. They sound the same, but they aren’t quite perfect rhymes. Dickinson also used dashes in her lines, which often signal a pause when you read them. Also, notice the capitalization. Dickinson frequently capitalized the nouns in her poems. Make a note of the words she capitalizes. They are usually the key images, symbols, and metaphors of the poem. Take a moment to think about what they all have in common. After you have had a chance to read the poem aloud, click on the YouTube clip below to hear Thomas himself read it. Did you get a sense of how theatrical his performance sounded? Dylan Thomas, (1914-1953) was hugely popular during his short life for his live performances. He was treated very much like a rock star in his era. Thousands of people came to his poetry readings, he sold huge volumes of records featuring his readings, and his radio plays were enormously popular in his native Wales, across the UK, and in America. Thomas was also known for his rock star behavior. He abused alcohol and often showed up to his readings drunk, where he heckled the audience on stage like Jim Morrison and other brilliant, but troubled rock stars that came after him. It was his drinking that eventually put him in an early grave. Originally published in 1951, “Do Not Go Gentle Into that Good Night” is one of the most widely read poems of the 20th century. Ironically, he died only two years after writing a poem about resisting death. Yet, the death discussed in the poem is not Thomas’ own, but his father’s. How might the fact that he wrote this poem about his father impact the way you read this poem? 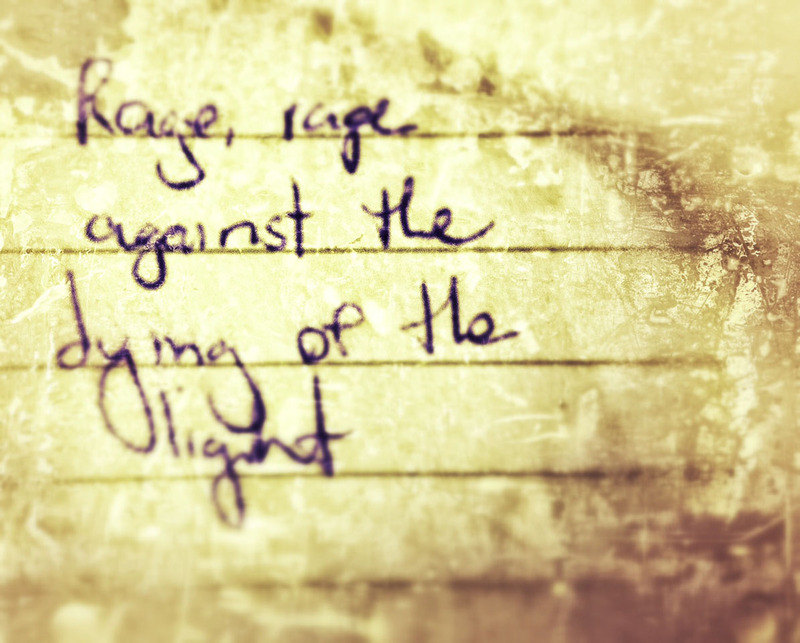 What does it mean when he tells his father to “rage against the dying of the light”? – The first and third lines of the first tercet are repeated alternately until the last stanza, which includes both repeated lines. The poem is deceptively complex. Villanelles are extremely difficult to write because you must repeat certain lines without sounding tedious or boring and you have to come up with several words that rhyme the same way without sounding forced or cheesy. This poem is known as lyrical poetry, a poem that expresses the writer’s emotions in an imaginative and beautiful way. Now that you know who the persona is (Thomas himself) and who the audience is (his father), think about what the emotions of the speaker. What are Thomas’ feelings about his father’s impending death? Finally, consider the tension in this poem. As you read, the tension is the “equilibrium of opposing forces in a poem, usually referring to the use of language and imagery, but often applied to other elements, such as dramatic structure, rhythmic patterns, and sometimes to the aesthetic value of the poem as a whole.” There is a tension in this poem between life and death. How does Thomas describe the tension between life and death? Think about the tone and images he uses to describe the both of them. How does he use opposites to contrast death from life? Why does Thomas think his father, and other figures he describes in the poem should “rage against the dying of the light”? Much like Yeats, WH Auden (1907-1973) was also widely praised and known for the social and political commentary of his poetry. Originally born in England, Auden immigrated to the United States after fleeing war-torn Europe. He was among the group of young artists that flocked to the cabarets of Berlin in the 20s, only to narrowly escape as Hitler and the Nazis rose to power in the 1930s. Much of Auden’s poetry of this era chronicles the sweeping changes in society across Europe that would eventually culminate in World War Two. He harshly condemned the Nazis, the Fascists in Italy, and Franco in Spain, which earned him a few enemies and thus necessitated his escape to America. Although it may not appear this way at first, Musée des Beaux Arts is infact a political poem. At first we notice that he is writing about paintings, in particular, three paintings by the Flemish artist Pieter Bruegel the Elder. This form of writing about art is called ekphrasis. In this painting, Bruegel depicts the famous scene from the Bible in which Mary and Joseph must travel into Bethlehem in order to be counted by the Roman Emperor’s census. However, if you notice, it is snowing. Thus, this is not happening in Biblical lands. Instead, Brugel depicts it happening in his native Belgium and it is the Spanish, not the Romans who are conducting the census. In this painting, Bruegel depicts another scene from The Bible, the part of the story of Christ’s birth in which King Herod massacres all the young boys of Bethlehem when it was foretold to him that a new King, a King of King’s would be born there. That baby, of course, was Christ. But once again, you can see this painting is taking place not in the Biblical lands. It is again set in Flanders, Belgium. Just like in the previous painting, Bruegel has taken a Biblical story and retold in in the context of his own home and time. In comparing the treatment of King Herod toward the people of Bethlehem to the Spanish Habsburg empire to the people of his own land (which they occupied) in Flanders (now Belgium), Bruegel essentially states that they are being unfairly tyrannized and brutalized by an occupying power. To understand this painting, you must first understand the story of Icarus in Greek mythology. If you haven’t heard of this mythological story before, check out this wikipedia summary. Study both the painting and Auden’s description of the fall of Icarus. Notice where Icarus is in the painting. The painting is titled after him, yet he is off in the distance and not the focal point. How does Auden give commentary on why Bruegel painting this scene this way? What is Auden saying that Bruegel is arguing about the nature of tragedy and how we respond to it. Finally, to tie everything back together, it is important to know that this was written as the Spanish Civil War was taking place, which would ultimately be won by Franco and his dictatorship. Auden saw in Franco a repeat of the kind of brutal Spanish rule that the Habsburgs wreaked on Bruegel’s Flanders. Furthermore, if Auden is saying that what is depicted in the first two paintings is happening again right now, and that the response of the world to it is depicted in the third painting, then what is he ultimately saying about how people are responding to the rise of fascism and dictators (like Hitler, Franco, and Mussolini) in Europe in the 30s?